Ok, first, maybe the real table, which i never played, give you a challenge for having these dark black- dark red rubber for flippers. So my comparison im going to make is with TPA. The brightness of the flippers in TPA is clearer, which make it easier to see. But perhaps its not like the real thing, the dark flipper might be part of the challenge? Iv notice also playing Classic Single Player give you different color flippers, so im guessing that arcade or tournament setup are ment to be more difficult with these flippers? Got hard time seeing these flipper ( playing on Switch handheld mode , perhaps its not helping on a small screen? ). Could the brihtness on these flipper be increased a bit? Black Rose is a unique situation, where the European version has a different flipper setup compared to the US release. The arcade operators in Europe demanded a more challenging game, so WMS obliged by changing the size and color of the flippers. The US version uses tradition flippers, but since Zen is in Europe they went with the European configuration. But i still want to point out the brightness difference between TPA and Zen versions. Visual is a no contest, Zen look way better, but the brightness on the flipper on Switch ( tried trial on PS4, same thing ), is way darker if im taking a comparison of TPA. 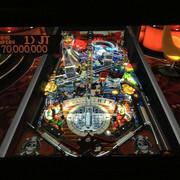 Is the real pinball as hard to see the black flippers? I mean if its supposed to be that dark, its a good thing, its a crazy challenge. I can still turn Zen FX effects on and the flipper change color to red and white to correct the issue to make it more playable, but its more wondering if the brightness on black and red flipper isnt a bit too dark than it should be. I struggle to see the flippers on PS4 playing Classic Arcade mode, it's a pity as I gave up playing this table because of this. Thanks for starting this topic, we'll take a look at the comparisons! I think you should make the ball black, like a cannon ball.